Read 2 times. Last read February 24, 2014 to March 16, 2014. 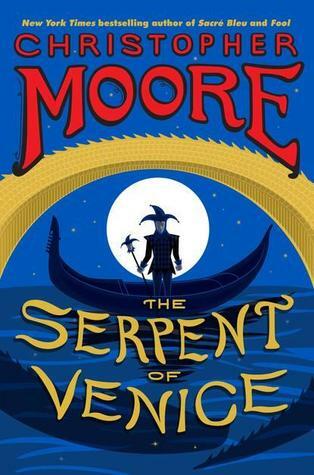 In the Serpent of Venice, Christopher Moore once again visits the physical world of Pocket the fool and the literary world of William Shakespeare (with a slight touch of Edgar Allan Poe thrown in for good measure). This time around, instead of King Lear, the source material is a mash-up of Othello and The Merchant of Venice, only set in the late 13th century and Pocket is embroiled in a battle to save Venice from itself while at the same time, helping the course of true love… all while dealing with his own depression over the loss of his queen Cordelia. Oh yeah, and there’s some sort of sea monster roaming around the Venetian canals wrecking havoc an death on whatever comes across its path. I freely admit I’m a fan of Moore’s work, a collector of harlequins and a sea monster aficionado so I was anxiously awaiting this book from the moment I first heard about (and was lucky enough to score an advanced copy) so my opinion may be a little biased. I’m okay with that. That all said, this is not Moore’s best book. But it is good. It’s very very good. It follows Moore’s general line. His characters seem delightfully anachronistic and Pocket reads like Tyrion Lannister’s more fun twin. The rest of the characters, interestingly, point up the similarities between the two Shakespearean plays (something Moore himself describes in detail in his afterward). Makes it really easy to see how these two plays could easily be done in a rep situation, with most characters having an almost equal corollary in the other storyline. Where I think Moore falls down is his reliance on his own cleverness. This is something which works well in small doses and was relatively absent from his last book, Sacre Blue. Here, it shows up with a vigorousness which is not needed. Like a sitcom character getting long in the tooth and has come to be defined by his catchphrases rather than any real development, Moore here seems to be writing for people who are waiting for lines so they can react like insiders. This is most obvious in the cursing. Moore slaps himself on the back a little too hard with his creative invectives and sexual innuendo. Don’t get me wrong, it’s still well worth the read and I’m still happy Moore is writing, because the rest of the tale is wonderful. His actual cleverness (underplayed and left for the reader to discover in due course, rather than telegraphed) is great. If you are in any way familiar with the plays and the short story The Cask of Amontillado, then you will know certain evens are coming and will be able to guess the actions of certain characters – but knowing an action does not indicate motivation or lead up and that is where this book excels. Like Stoppard’s Rosencrantz and Guildenstern Are Dead before him, Moore is able to seamlessly weave his own characters into the Shakespearean fabric in such a way as to make it seem not only plausible, but makes you wonder why these characters weren’t involved from the beginning. Sign into Goodreads to see if any of your friends have read The Serpent of Venice. Wishing you were going to be in LA for this event. Lita wrote: "Wishing you were going to be in LA for this event."